Thuraya is one of the few companies specialized in satellite phones. You know, those phones that work just about anywhere in the world. Obviously, when it comes to satellite phones we don't talk about design features or stuff like that, as these devices are meant for a single purpose: communication. Well, it looks like Thuraya has just announced world's first dual mode, dual SIM phone. Such a phone will allow users to seamlessly switch between satellite and GSM communication. The new phone is called XT-PRO DUAL and comes with a dedicated slot for satellite communication and a second one for GSM networks. The phone comes with a feature called “Always On,” which enables users to alternate between calls, while remaining connected to both satellite and terrestrial networks. Obviously, the phone is aimed at those who travel a lot or live in areas with limited GSM network coverage (or not at all). Thuraya's satellite's network should cover more than 160 countries across Europe, Africa, Asia and Australia. Also, the phone's GSM modeis supposed to support most 2G and 3G bands across the world. 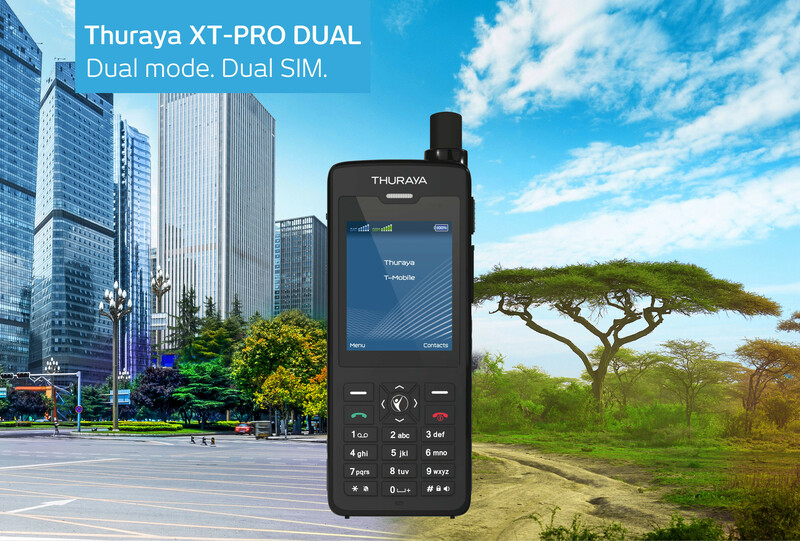 Thuraya also claims that the XT-PRO DUAL is industry's first phone to feature advanced tracking capabilities based on preset time intervals, distance traveled, and detection movement outside a preset geofence.